You must apply specific conditions in Allscripts Enterprise EHR™ for the application to auto-generate the Noteform Dictation task. 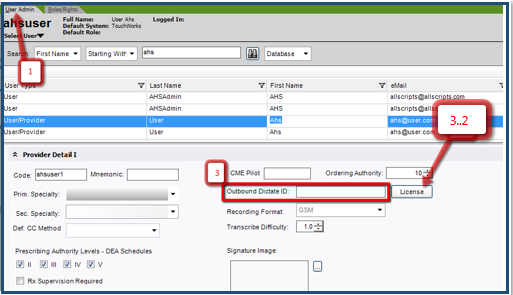 Verify the user has a value for Outbound Dictate ID in Provider Detail I. If this value is not present for the user, you must enter a value. 3.3 Enter the values in Dictate License Dialog as instructed by your Allscripts support representative. 5. Verify that the user has Enable Dictation Marker Tasking selected in Dictation User Preference. You must have the dictate module installed in Allscripts Enterprise EHR for the dictation toolbar to be available. 5.1 Log in to Allscripts Touchworks EHR as the user. 5.2 From the dictation toolbar on Clinical Toolbar, open Dictation User Preference by selecting Dictation > User Preferences. 5.3 Verify that Enable Dictation Marker Tasking is selected and click OK. Enable Dictation Marker Tasking is set only for each user; it cannot be set for the enterprise or organization. When the user creates a new dictation marker in note, the application generates the Noteform Dictation task for the user. This page was last modified on 19 August 2014, at 08:38.